Wireworms damage root and tuber crops such as potatoes and carrots by tunneling, causing unsightly holes as well as providing an entry point for pathogens. Young seedlings with small root systems can be weakened or killed. Wireworms are the larvae of click beetles (family Elateridae). There are many species of wire­worm. The larvae have slender, hard, ¾ -2 inch long bodies that range from tan to orange to brown in color. The larvae pupate in the spring, and the adult beetles emerge and are active in the summer. The adult beetles are not typically pests. Female click beetles lay eggs during May and June. They lay eggs in the soil, primarily in weedy or grassy fields. The eggs hatch in 3-4 weeks, and the larvae then look for food. The larvae can live for several years, depending on the species, availability of food, temperature, and soil moisture. Because eggs are typically laid in grassy fields, wireworm problems are usually most severe in fields that were recently sod. However, because the larvae can live for several years, problems can persist in fields that have not been sod for some time. And grassy cover crops can attract adults for egg laying. Wire­worms are often more prevalent in moist areas of fields, and in areas with high organic matter. Wireworms are omnivores. They feed on the roots of grasses or weeds and on other soil insects. It is hard to starve wireworms out of a particular area, because of their diverse diet. Crops that tend to increase wireworm popula­tions include potato, carrot, sweet potato, small grains (wheat, barley), onion, beet, and clovers. A clean (non-weedy) alfalfa crop can reduce populations. This may be in part because of alfalfa’s deep root system reduces soil moisture, making the environment less favorable for the larvae. Rotation into alfalfa or crops that are not preferred can reduce wireworm populations. Avoid plant­ing highly susceptible crops such as potato and carrots into sites with a high potential for damage, such as fields previous­ly planted to grass sod, pasture or small grains, or fields with a prior history of wireworms. The edges of fields (near sod) can also be a problem, because the larvae can move through the soil in search of food. Baits can be used to determine wireworm pressure prior to planting a susceptible crop. This can be done by placing carrots or potatoes in a softball-sized hole about 4-6” deep, covering with loose soil, and then covering the area with a piece of black plastic to warm the soil. 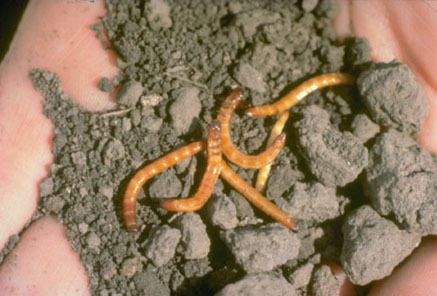 Wait 4-7 days, and dig up the bait to check for the presence of wireworms before planting. Another version of this method involves burying a fist-sized clump of corn, wheat, or rolled oats. It may also help to harvest crops as soon as possible. Moisture in potato tubers if soil conditions become dry, and wireworm damage increases over time in potato crops left in the ground.